Wow, two years after you wrote this post and nothing has changed! I just downloaded one and first, it took forever to get emailed and now I’ve wasted 45 minutes trying to figure out how to down load it. What a waste of precious sewing time! I’m spoiled with indie designers I guess. NEVER again. And I stupidly tried for the second time to try PrintSew. Never again!!!! Huge waste of half a day to get the most technically absurd piece of software ever written to work. My plea to their tech support result in another lost day and the offer to cancel my order for me. You Betcha!! once again, three years later!!! its absolutely terrible. 2019, je e me sens volé par simplicity et print sew. Plus de 20 modèles (patrons) et je ne peut imprimer aucun. J’ai été malade et le temps est passé, la page web de Print sew ne fonctionne plus. THANK YOU. I have chrome and I was suspicious when I was reading the details on the butterick website. You’ve confirmed my suspicions and I won’t be buying the printable patterns. I think I’ll just head to the store and buy an old fashioned one. I like the BurdaStyle patterns, but it can be hard getting one that’s in my size and I’m not up to the level of resizing a pattern yet. NEVER, NEVER again either. I have been in contact with Printsew and they keep saying they will look into the promised refund. NEVER happens, just lost 5 dollars. As for the time wasted int dying to make their suggestions work – on different browsers. Downloaded a similar pattern from Burda without any problem. But I don’t like the feeling a having ‘been had’. Hope this informs others. I’m using Chrome and Windows 7 and didn’t have any problems with printing. Pasting the papers together (using rubber cement, as suggested in their instructions) was a bit daunting though. I live outside the US so downloading was the cheaper option for me. I think next time I will order online and have one of my relatives bring them to me when they go on a vacation here. Scotch tape works well for me. I have just had the same experience as you with a Simplicity printsew pattern. Painful. 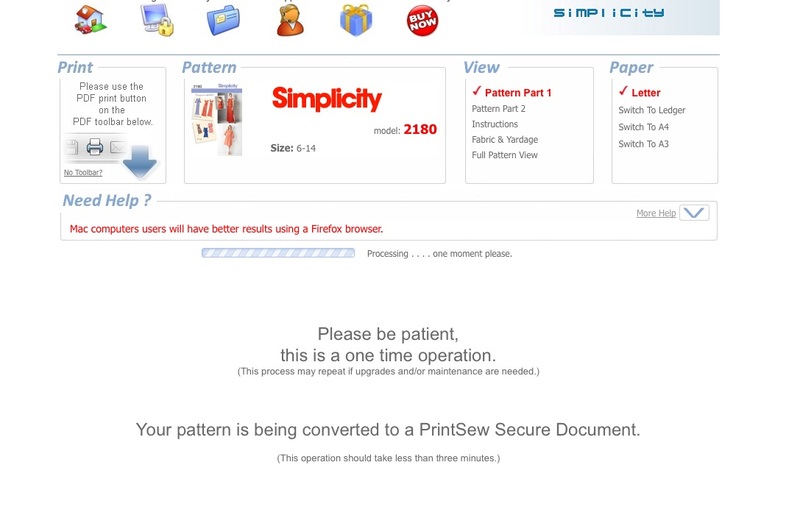 It has taken a week to be able to access the pattern including lots of email exchanges with printsew. I don’t mind taping pattern together I just want to have it. I wish I had rung around local stores to find the pattern – the added cost would definitely outweighed the frustration. To be fair to Print Sew and Simplicity I have successfully printed a pattern (and made the dress) prior to this experience. I bought my Simplicity 3835 pattern in April 2103 and it took me close to 2 years to work out how to print the darn thing. I didn’t have a printer so to it to work but couldn’t download the plug in as I wasn’t authorised. In the meantime I lost the link. Terrible waste of time, I too purchased a printable pattern – it was sold as an “INSTANT” download. Hours later, having received nothing, I am still being passed from department to department always ending up with an answer machine. Will never use again, and am now pursuing a refund……. 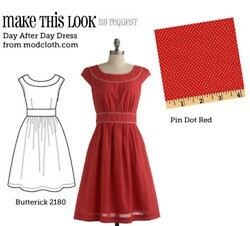 I have purchased a Butterick pattern and cannot get anywhere with it. It is stuck in cyber space and it is so complicated with my mac that I gave up. However, they definitely lost a customer. If they want to keep their clientele they will have to make it user friendly. Well I have read through all these and wonder why we do not all complain, complain, complain. They would all get sick then and does not do any harm when writing or mailing about whatever is wrong to mention trading standards or newspapers. Just saying. My biggest peeve is the same charge for downloading pattern. Absolutely disgusting. I could not get the software to install – so I wrote support and they sent me a different link which did work. I also agreed to and registered the license – but the pattern still won’t download. It keeps telling me that I didn’t install the license but when I try to reinstall it tells me it can’t because it is already installed. I’ve spent two nights doing nothing but trying to download a pattern for an “ok” dress – nothing special! I have no idea how this business model works. I suppose they just get people to buy one thing and then they don’t come back when they realize that the software doesn’t work! I’m not sure that complaining helps. They need to hire a competent programmer. Whoever designed this quirky, complicated, and non-functional software was an amateur! Well! I certainly wish I’d found this thread prior to purchasing a digital Simplicity pattern. Print Sew is a terrible system, and I have had the same problem as Jocelyn. Couldn’t download the software then couldn’t open the pattern because I didn’t have permission even though it tells me the license is installed. The only reason I am attempting to download a PDF is because Simplicity no longer comes to Canada. I have a very large student who does not fit the patterns I usually use for the Beginner Sewing lessons. If I can’t download it I will have to drive to the US to purchase a pattern at Joann’s . SO FRUSTRATING! I also have a problem with Simplicity and the rest of the Big Four as they will not give me a teacher discount so I can purchase patterns to re sell to my students. I am not a non profit! Well, I’d like to see one teacher that works for free! The school may be non profit but the staff gets paid. By the time I order the patterns, pay shipping and duty AND in US funds it becomes a VERY expensive pattern. AND the real kicker is I can’t even order 10 online, they always say out of stock! AND I have complained to Simplicity many times. I have begged them to give me a special bulk order for my classes. They don’t even reply. Methinks the Big Four will be gone soon! I SO much agree with you Erin ! sewing patterns.com has THE worse platform EVER! I am in the Seattle area. Would it be worthwhile to have me purchase the patterns for you and mail them to you in Canada? I am desperately searching for an out of print Simplicity 7820 Adult Tin Man costume pattern. Would any of you know 1. where I might find one? 2. have one I can borrow to copy? 3. have one I can have? 4. have one I can buy? I do understand your frustration, I felt it too, but once you download the pug inn it works and if you have Windows 10 you can do it from Chrome. Burda style is easier but let me tell you, I have a few decades using Burda patterns and the ones they are making now are AWFUL ,the fitting is never good if you don’t retouch them ,something that never happened with the old Burda that had the seams allowances included and that made a HUGE difference. Simplicity sewing patterns online downloads. It doesn’t work. Even if you manage to install the program, even if you get the license to work, even if you finally see the file after 3 days, even when you manage to print it…. when you start sticking it together… after printing 68 pages… nothing matches… the lines dont match up. I should have googled this before. I purchased quite a few and I have no printer. I print everything from the library. I can’t now. I love Burdastyle and have purchased many patterns from them and it is a cinch. I can’t believe I can only download this pattern 3 times for the year. This is a ripoff. Bring back the tissue ‘falling apart’ paper any day. The first time I used Print Sew it was a major frustrating hassle but it worked. I bought 2 patterns a year later and the only patterns that show up are the ones I bought last year. No response from customer service. I will not use them again. Thanks, you just saved me a whole lot of hassle. I must say that even though Burda patterns are affordable and easy to download, the patterns are not great and the instructions are terrible. I wish more pattern companies would follow the downloadable option as not living in the USA or GB the postage costs me more than the patterns. I bought a vintage pattern 2 years ago – Printing took three weeks. I still have not figured out how to piece it together. It does not work in the simple manner they describe it to be, not even close! Downloadable patterns are not for me and never will be. I want to sew and I don´t want to spend hours with downloading, putting tons of pattern pieces together…..puzzling…..no way. Downloadable patterns are just a way for companies to reduce their own expenses (no pattern printing costs), charge the customer far too much nevertheless and as a result increase their profits – once again. I wish I had found this before buy a pattern through this company. At this point I’m tearing my hair because the license won’t register. I’ve followed the instructions to the letter, uninstalled, reinstalled and so on. And after reading the comments above about the printing problems and the number of pages, I will avoid this website like the plague. Other PDF patterns I’ve bought, I’ve been able to take them on a USB drive to an office copy shop and had them printed on a single A0 size sheet. It was only $5 or so, but lesson learnt. I’m really angry because I feel so ripped off. Don’t waste your time with this company just a waste of time and money. It’s 2017 and nothing has changed. I had such a wonderful PDF pattern experience with SEWDIY that I decided to do another one. Sadly this New Look PDF pattern has been awful. Had to ask them to reset my printing limit because the test block is just not aizing right. The LockLizard DRM is an awful awful experience out of Internet 1.0. I’m thinking of going to my local store to just buy the printed version as I can’t trust the PDF I’ve printed. Horrible. Horrible. I Should have read your post before all of this back and forth between Simplicity , print and sew , and I ! I was working on a dress from simplicity # 1149 last year and my daughter got sick and was diagnosed with cancer so i had to stop sewing for a while but i lost the sewing instructions some where and I contacted Simplicity, they directed me to printsew , print sew directed me to youtue, youtube had me download other apps and it still didnt work so I contacted print sew and they asked me to send me my conformation email from simplicity , I sent them the email simplicity sent me and contacted simplicity they sent an email to confermate my email? and now none of them is answering EASTER is tomorrow and my daughter has no dress thanks to them both I have wasted 2 almost 3 days now just trying to get INSTRUCTIONS !!!!! CRAZY!!!!!! and COMPLETELY WORTHLESS!!!! if anyone has the sewing instructions can you please send them to me I would really appreciate it so my babies EASTER wont be ruined she just wants to be a princess. I wish I entered the name of the company before buying the pattern… I can’t even install the viewer and I understand now that even if I manage to install it I will never be able to print the pattern as I don’t have my own printer and have to print it at my school… impossible with their awful system. I’ve been using printsew for years and I totally agree it is super frustrating. Lot of glitches! I really get upset that only have access to the pattern for 1yr then it disappears from your library. Even if you haven’t used any of your 3 allowed prints. Very Annoying! I just downloaded a pattern and I found an easy solution!! On PC, I don’t know if it works with mac, you just have to change the name of your “printer” “Microsoft to pdf” to a random printer name like “HP stylus 22245”. Then you select this printer and “print”. The software thinks it’s a real printer and it works, the file is converted to .PDF and you can now print your pattern or do whatever you want with it. YOU ARE A LIFE SAVER!!!! Thank you so much for this tip! It worked so well! THANK YOU, THANK YOU, THANK YOU! Hey, my boyfriend actually thought of this and I did this but I’m not sure it’s printing it right. How do I know if the size is correct? I chose paper size A4. unfourtunately I am yet another with a bad experience using the print sew patterns to print Simplicity 8330. I chose to print as its not available here in NZ as a printed pattern yet. Difficult to access the pattern, I had to wait 3 days until I got my confirmation, got charged for shipping on a PRINTABLE pattern, in addition to my international buyers fee. NEVER AGAIN. Im sticking with the patterns created by some very talented Mothers and Hobbyists at their own websites. The WORST service ever. I have made several complaints to Simplicity and have yet to receive a reply. I’m filing for a charge refund through Paypal and then my bank, if necessary. MANNNNN! I so wish I’d read this before purchasing (twice – yes stupid I know but I’m in a hurry) First time on 13 June – then an event popped up and I had to postpone my sewing… the lovely lady needs it by Friday now – so I jump back on and there’s nothing – not even any emails from the Print Sew people as it says – I can’t even log in – seems my account has been magically deleted… So i create another account and yep it happily accepts my email and order…. once again…. no email from Print Sew……..Fingers crossed they have the pattern at our local sewing store… What a joke. I buy downloadable patterns off Etsy all the time and they’re brilliant… Here’s to two paypal disputes! Don’t go there folks if you are reading this before you buy! Hi ladies I have been downloading patterns for years from Print sew and have no issues at all. I have them all downloaded into my documents and have printed many off with no trouble at all. Yes you cant use Chrome but i use firefox or internet explorer instead. I click on the instruction, fabric required pages etc and save to my documents, then when I open each pattern page there is a wee download tab at the top that you just download them to your documents. Its easy. Yes you do have to download the viewer (i think its called that) but once you have that away you go…..I think there are instructions on how to download, but I have had about 25 patterns now and its great. Most of the patterns I print of are through sewingpatterns.com and I have many of their free ones also. It has been days for me trying and trying, install remove reinstall, every web they ordered to install i have done it, i even did “factory settings reset” and installed all what they asked in my new computer but always having a problem!!! Since years i am ordering patterns and did the PDF without a problem. I decided not to order again and cancell my account, maybe when they see that they are losing customers they will find easy way to download. Anyone agree? Very frustrated with PrintSew experience. Download is complicated and time consuming, and did not succeed with the process! Ask for a refund but after a phone calls and several emails have not received it as of this writing. Lesson learned!! Good lord PrintSew is the worst website ever! I can’t even get the site to load, never mind print anything or register anything on it. I won’t be using them again. I will stick to my favourite indie pattern retailers. Too bad because I would have been a very good customer as I buy A LOT of downloadable patterns. I can’t believe that a large corporation like this can’t get their website running properly. So terrible. Holy moly! I got it to work! I have no idea how. I just pretty much clicked on everything, and agreed to all their terms. LOL! 30 pages of pattern though?!! And most of the pages are blanks but they have a border so they print anyway. I can see how to put the pattern together though. It is assembled by row and by column. It shouldn’t be too much trouble but I still probably won’t order from them again just to avoid future hassle. I really wish I had’ve read this thread as well. I made the mistake of buying a printer from Simplicity and now I’m having trouble printing it. How do I know if I’m printing it the right size? It seems to me like something is off. Can someone help? I unchecked the fit to content option, but it seems like something is off. How can I check the size is right? Never again from the Simplicity site! Just like ALL the others here. A waste of time and effort for not even a great pattern. Yes, I’m having horrible problems too – I downloaded the pattern, license registered, and now can’t print because the viewer refuses to recognise the license. A total waste of an afternoon and my money. I will be buying paper patterns only from now on. I STILL after purchasing over 2 years ago have not been able to download and print the Burda 7195 pattern I purchased from them. I contacted their support (which is a joke), and was told that my access to a product I paid for had expired after NEVER got to work because the program that unlocks the PDF kept saying my code was invalid and used too many times. I just want the pattern, and am about to buy it yet again just to see if my new computer and the suggestions to use any browser other than Chrome will help with the download. Wish me luck because I went OFF on them via email for their abysmal support in getting any help. After this purchase, I would rather comb goodwills for OOP patterns versus use them again!